On the chaotic side of metal, there are a slew of bands today trying to overcompose each other and make the most intricate yet ballistic music on the scene. Add Milwaukee's Forever is Forgotten to that list, as this quintet pummel with relentless riffs and thunderous rhythms. But, like so many of its peers, there's a lot of technical excellence underneath the schizophrenic sonic output that makes this re-release so appealing. 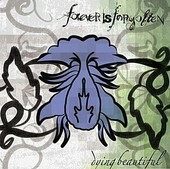 If you enjoy bands like Candiria, Shai Halud, and Between the Buried and Me, then Dying Beautiful is worth the purchase.